Pop music from Japan? A red-and-white drawer instantly pops open in your head, and what’s inside sounds weird and funny and always a bit hyped-up. Have fun. Those who are satisfied with this actually miss a lot. Those bands that won’t fit into the drawer - like Sugar Plant. Shin'chi Ogawa (guitar & programming) and Chinatsu Shoyama (bass & vocals) met at the university in 1993 and formed their band shortly afterwards. The name really refers to a sugar plant in Kawasaki City – and not an exotic japanese fruit. 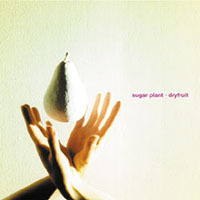 "Dryfruit" is Sugar Plant's third album, and it's a little aural gem that far too few people had heard. You're instantly captured by the quiet beauty and the dreamy voice of Chinatsu Shoyama. Pure ambient sound, a piece of time, enclosed like a fly in amber. Once you've submerged into Sugar Plant's zero-gravity trance pop and you have surrendered yourself to the magic of Chinatsu Shoyama's voice, everyday life steps back for a moment. Just let yourself go - Sugar Plant will catch you. And then the CD is over. The heartbeat that has slowed down is quickening again. The world is taking breath. But doesn't it look brighter and much more beautiful now?